Most acids have one common feature and that is the presence of the hydronium ion, which is represented by H+ or H3O+. Concept #1: Identifying Binary Acids. Hey guys, in this new video, we’re going to take a look at acids. We’re going to see what are the key features that make acids acids, and more importantly, how do we distinguish one type of acid from another. So if we take a look at the beginning it says the most common feature of an acid is that it possesses an H+ ion. Now here’s a thing, not all acids have H+ but a majority of them do. Or we’re going to say the name of this H+ ion is hydronium ion. Later on we’re going to learn that certain types of acids don’t possess H+ at all but they’re still acids. They’re just a special type of acid which we call louise acids. When we get to that section we’ll cover that in detail, but for right now just remember most acids have H+. This H+ ion is called hydronium ion or hydrogen ion. And we’re also going to say here is H+ is the same thing as H3O+. You’re going to see that your professor uses them interchangeably. That’s because those same exact thing, they’re just a different rate way of writing the same exact ion. So just remember H+ is the same thing as H3O+. Now we’re going to say when it comes to acids there are two major forms. Now the simpler of the two are called binary acids. Now binary acid possesses H+ and that H+ is connected to some electronegative element. Now we’re gonna say the electronegative element would be Nitrogen, Sulphur, Phosphorus, or some type of Halogen, Fluorine, Chlorine, Bromine iodide. Now the key things that binary acids don’t have is, were going to say no binary acid has oxygen. If you have oxygen on an acid that will be different type of acid. So all binary acids none of them oxygen present. Now the second thing is, they usually possess no metals. Usually if we have a metal within a compound, it’s ionic. And usually it will be a base, if a metal is involved, it’s usually a base. Of course there are exceptions to this and we’ll talk about that later on. Now we’re going to say here, the most common types of these particular acids are called your haloacid. Halo means that we have a halogen, and of course acid is H+. So remember the halogens are in group 7A, and if you’re in a group 7A what’s your charge? Hopefully you guys remember the charge distribution in the periodic table. So remember if you’re in a group 7A your charge is -1, so we have F-, CL-, BR-, I-. So when we have positive H+ connecting with one of these negative ions, our haloacids would be HF, HCL, HBR, HI. So these are your four haloacids, hydrogen connected to a halogen. Now we could talk about other types of common binary acids based on groups. So we just looked at group 7A. So that would be HF, HCL, HBR, HI. But remember we also got group 6A involved. Remember when you’re group 6A, your charges are -2. So we’re going to skip Oxygen in group 6A because again, binary acids don’t possess any oxygen. So if we go down groups 6A and you’re looking at the periodic table, the next would be S2-, Se2-, Te2-. And again this guys are combining with H+ to give us a binary acid. So let’s just remember what we learn about ionic compounds. How do we make them into compounds? Remember the charges, the number from the charges crisscross to give us our compound. So we’d have H2S, H2Se, H2Te, so these will be your binary acids that are common to group 6A. And then we could say that we have certain ones that are a little bit different. So these are the odd ones, that their technically still binary acids, they’re just a little bit different. So here we can have HN3 and here we can have HCN, so those would be the odd ones out. They’re a little bit different from group 7A and 6A but they’re still binary acids because in here we have H+ connected to a negative ion (N3-), and here we have H+ connected to a polyatomic ion CN-, cyanide ion. Now we’ll learn how to name these later on in coming videos, but for right now, this are our typical common types of binary acids from group 6A, group 7A and also the odd ones. Now that we’ve seen these first type of acids, it’s time to talk about the second type. Binary acids can be identified by the fact that they all possess an H+ ion attached to an electronegative element. Oxyacids can be identified by the fact that they all possess an H+ ion connected to a nonmetal and oxygen, hence the prefix “oxy”. Now were going to say the second type, they’re called oxy acids. And from the name oxy you can tell that it has one particular element in there, Oxygen. So we’re going to say oxyacids are acids that contains H+ ion of course, they contain Oxygen, and they contain some type of none metal. So the difference between binary and oxy is that, oxy has Oxygen involved binary does not. Something else they both share in common is that, they usually don’t possess any metals. Again we’re going to see, usually when we have a metal involved that compound will be a base. Now we’re going to say that oxy acids are formed when we hydrate none metal oxides. So with this example here, our none metal oxide would be Carbon dioxide here, and here would Sulphur trioxide. So none metal oxide just means you have a none metal connected to Oxygen. Now all what’s going to happen is the water is going attach itself to this whole compound. And what we get are two types of oxyacids, and they’re oxyacids because both have H, both have Oxygen, remember that H is really H+, they both have Oxygen and they both have some none metal involved. And that’s what makes them both oxyacids. So here we would have Carbonic acid, and here we have Sulphuric acid. And again we’ll learn how to name these particular types of acids later on. But for right now just realize, how do we create oxyacids? We just add H+ to some type of none metal oxide, CO2, SO2, SO3, those types of compounds. PO3, those kind of compounds you add water to, to make your new types of oxyacids. Now that you guys have seen the two types of acids, binary and oxy, I want you guys to try to answer the next following question. Here I say, “Which the following compound or compounds cannot be classified as an acid?” I gave you just brief description on both, but try to use the best judgement to determine which ones could be, which ones could not be. Then once you’re done with that, click on the explanation button, you’ll see a video of me explaining how to approach this problem, guys. Goodluck! They are created by the hydration of nonmetal oxides. Conversely, metal oxides create bases when hydrated by water. Practice: Which of the following compound(s) cannot be classified as an acid? In this video we're going to take a look at the strength of binary acids. So, remember we talked about there being two classes of acids, there are binary acids and then there are oxyacids, for binary acids we'll go over the different roles that are associated with determining the strengths of different binary acids, binary acids have their own set of rules, oxyacids, which are a different type of acid, will have their own separate list of rules that we follow for them and we're trying to compare the strengths of different oxyacids. Now, regardless if you're looking at a oxyacid or binary acids, we're going to say strong acids in general are strong electrolytes. So, they ionize completely in water, here we have HCl, which is a strong binary acid, we have a single arrow going forward to show that it completely ionized it, it goes to completion, so that means we're going to make 100% of both of these ions, weak acids are weak electrolytes and again whether it be weak oxyacids or weak binary acids, weak acids in general are weak electrolytes. So, they don't completely ionize in water, here we don't have a solid arrow going forward, we have double arrows to say that instead of going to completion our reaction reaches an equilibrium. So, we're going to say an equilibrium is established, so that means we're going to make less than 100% of these ions, and in fact, we tend to make a very small amount of these particular ions. So, when it comes to weak acids we're going to have to basically set up what are called ice charts later on in order to determine the pH of these different types of weak acids. Now, what we're going to talk about binary acids, keep in mind again there are two classes of acids, these are just the rules for binary acids, when we talk about oxyacids they have their own separate list of rules. Strong Acids are strong electrolytes that completely dissociate into ions when dissolved in water. Weak acids are weak electrolytes that don’t completely ionize, but instead reach a state of equilibrium. Concept #4: Strength of Binary Acids. Now, the strength of a binary acid is based on two major factors. First, it’s based on the electronegativity or the size of the non-metal that’s connected to my hydrogen. In this case, this non-metal in HCl that we’re talking about is Cl. And in HF, the non-metal that we’re talking about is fluorine. So the strength of a binary acid is based on those two factors, electronegativity as well as the size of the non-metal. Now, we’re going to say for elements in the same period and remember when I say period—we have a periodic table here. This is period one, two, three, four, five, six, and seven. Here we’d have boron, carbon, nitrogen, oxygen, fluorine and neon. They’re all on period two with each other. We’re going to say, elements in the same period, we’re going to look at their electronegativities in order to determine acidity. And basically, what you’re going to see here, the more electronegative the nonmetal, the more acidic. If we’re taking a look at certain examples, let’s say we’re looking at CH4, HF and BH3. So, we’re going to say that boron, carbon and fluorine are all in the same period. In terms of electronegativity, remember, it increases going from left to right. And because the increase is going from left to right, we’re going to say fluorine is the most electronegative out of these three non-metals that I’ve underlined. And because fluorine is more electronegative than boron and carbon, HF will be a stronger acid than CH4 or BH3. That’s the way we apply this. If they’re on the same period, we look at electronegativity. However, for elements in the same group, remember groups go vertical. This is: 1A, 2A, 3A, 4A, 5A, 6A, 7A. We’re going to say here—in this case, we’re going to say we look at their size when they’re in the same group. We’re going to say, the bigger, the more acidic. Remember, when we’re talking about size, we’re really talking about atomic radius. And we’re going to say, your atomic radius increases when you go down a group. So we’re going to say, let’s say we’re looking at different types of acids. Here we have: Cl, Br, and I. Let’s say, you wanted to compare HF, HCl, HBr, HI. We’re going to say that, all four of these non-metals are all in the same group. They’re all in group 7A. We’re no longer going to look at electronegativity instead we’re going to look at size, atomic radius. Going down the group, it’s going to increase. We’re going to say here, “I” would be the largest. And because “I” is the largest, HI would be strongest acid out of this group. So that’s how we look at electronegativity and how we look at atomic radius or size to determine which binary acid is the strongest. Now, one last thing before I’ll let you guys attempt to do the two practice questions at the bottom. The most common types of binary acids--we’ve already seen them. When H+ is connected to HF, we have HCl, HBr, HI. Group 6A will also be another common type of binary acids: H2S, H2Se, H2Te. For all purposes, we’re going to say that, these are the most common types of binary acids but only three of them are really strong. The only three strong binary acids you’re going to know this semester are these three: HCl, HBr, HI. Those are your three strong binary acids. For those three, we never have to do an ICE chart in order to find pH. For all the other binary acids: HF, HCN, H2S, H2Se, H2Te. All those others are weak binary acids. So we would need to do an ICE chart in order to figure out their pH. Just remember that these are the things that we use electronegativity and size to break ties between different binary acids but there are only three strong binary acids you need to know, HCl, HBr, HI. When looking at a binary acid we look at both electronegativity and size to determine their strength. Practice: Which is the weakest acid from the following? Practice: Which of the following acids would be classified as the strongest? The strength of an oxyacid depends on the number of oxygen atoms and the electronegativity of the nonmetal. Concept #5: The Strength of Oxyacids. In this video we're going to take a look at oxyacid strength. So, let's say here, that the strength of oxyacids is based on the number of oxygens or the electronegativity of the nonmetal, we're going to go over when do we look at either one. So, here we're going to say the rule is, the number one rule for oxyacids is, if my oxyacid has two or more oxygens and then hydrogens, then my oxyacid is a strong acid. 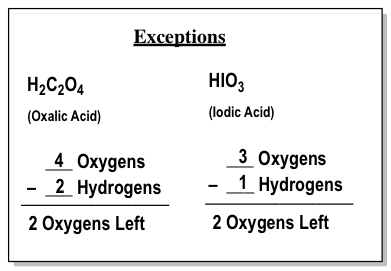 So, if we take a look at the first one, we have here, HNO3, we're going to face an oxyacid because it contains hydrogen, a nonmetal and an oxygen, here's the number of oxygens is 3 the number of hydrogen's is just 1, when we subtract them we have 2 oxygens remaining, you must have a minimum of 2 oxygens remaining in order to be considered a strong oxyacid, here it meets that requirement. So, it's strong, next one, we have phenyl. So, C6H5OH, here it has one oxygen and then it has five plus one more that six hydrogens. So, in this one we don't have any oxygens remaining, remember, we need a minimum of two oxygens remaining to be considered a strong oxyacid. So, this one doesn't meet the requirements. So, it's weak. Then here we have perbromic acid. So, here we have four oxygens, we have one hydrogen. So, we have three options remaining. So, we've met the minimum requirement of having at least two oxygens left. So, this one would be strong. So, when it comes to oxyacid, this is the first tool that you need to remember, you need to have a minimum of at least two more oxygens than hydrogen's to be considered a strong oxyacid, we're going to move on to the next portion when we talk about this topic of oxyacids but keep in mind this first important. If your oxyacid has 2 or more oxygens than hydrogens then your oxyacid is a strong acid. Concept #6: Comparing the Strength of Oxyacids. So, when comparing the strengths of oxyacids, we need to remember a few things. Alright, so when comparing the strengths of different oxyacids, remember, if they have different number of oxygens then the more oxygens you have the more acidic. So, for example, if we're comparing HClO versus HClO4, if we did the math of oxygens minus hydrogen's, this one has nothing left, this one here would have three oxygens left. So, this one would be stronger, if they have the same number of oxygens though then the more electronegative the nonmetal the more acidic, for example, if I was comparing HBRO3 versus HClO3, here in our periodic table we have fluorine, chlorine, bromine and iodine here and we're going to say here, when it comes to electronegativity. Remember, electronegativity increases, when we go from left to right and it decreases when we go down a group. So, when we do the number of oxygens minus the number of hydrogen's here, we're going to have two remaining for both, two remaining oxygens for this one, two remaining oxygens for this one, but chlorine is not as far down as bromine, since bromine is further down into less electronegative, and remember we just said, the more electronegative the nonmetal the more acidic it would be. So, when it comes to oxyacid strength, first look at the number of oxygens remaining, the one with more oxygens remaining will be stronger but if the number of oxygens remaining are the same then we look at the nonmetal, the more electronegative one will be the stronger oxyacid. Now, it's all rules of course there are exceptions that exist and here we have these three exceptions. So, this first compound here this is oxalic acid, this one here is ionic acid and this one here represents amphoteric species, which we'll talk about. Alright, so if we take a look at the first two, we have four oxygens in this one and two hydrogens, three oxygens and one hydrogen, both of them have the minimum requirement of oxygens left of two, but they're both weak, the reason they're weak is because the carbon in them and the iodine in them are not very electronegative. So, this weakens the acid overall. So, although they've met the minimum requirement of having at least two more oxygens and hydrogen's they are still weak because their nonmetals are not very electronegative. Now, amphoteric species are species that connect acids or bases, here this connect as an acid because it possesses an H but also can be a base because it's negatively charged, other ones that could fit this criteria H2PO4-, HCO3-, HPO4 2-, all of them have hydrogen so they can act as acid and they have a negative charge, so it doesn't matter if you do the math and they have a minimum of two oxygens remaining because they're amphoteric they're going to be considered weak as well. So, I just remember these are the three major types of exceptions when it comes to determining the strength of oxyacids and now that we've gone over that, let's see if you guys can answer the practice question left at the bottom of the page, attempt it on your own but if you get stuck don't worry just come back and take a look at how I explained the best approach of this question. If they have the same number of oxygens then the more electronegative the nonmetal the more acidic. With some rules there are exceptions. Oxalic acid and Iodic acid have two more oxygens than hydrogens but are weak acids because carbon are iodine have low electronegativity. Amphoteric species (compounds that can act as both an acid or a base) are also an exception to the rule for oxyacids. Practice: Rank the following oxyacids in terms of increasing acidity. Concept #7: Bases and Electrolytes. Hey guys! In this new video, we’re finally going to take a look at the strength of bases. So up to this point we’ve talked about acids. We’ve talked about binary acids and oxyacids. And we should know their strengths at this point as well. How do we determine when they’re week and when they’re strong? Again, this is important because weak acids, we have to use an ice chart in order to find Ph, strong acids we don’t have to do that. So what we’re going to say now let’s talk about bases. We’re going to say that strong bases are considered to be strong electrolytes. And what does a strong electrolyte mean? It means that it completely breaks up or dissociates when dissolved in water. Here you’re going to notice that you have a solid arrow going forward. Again this means, reaction goes to completion. So all of the reactant will break down basically to 100% so we get those two ions, we get NH+, we got OH-. Now weak acids are considered to be weak electrolytes. They don’t completely break down, they don’t completely ionize. Here again we’ll notice that there’s a double arrow, meaning that equilibrium is established. That means our reaction goes into forward direction as well as the reverse direction. Now weak acids, weak bases, favor the reactants. All that means is that our reactants really don’t break down that much. So a majority of our compounds will be in the form of a reactant, very little of it will be made into product. In the opposite way, strong acids and strong bases, we’re going to say they favor the products, which means nearly all of our reactants break down to give us products. So again remember, weak acids, weak bases, we need to use an ice chart to find Ph or POH. We’ll talk about those later down the road. It’s imperative that you guys remember how to identify things. Strong Bases are strong electrolytes that completely dissociate into ions when dissolved in water. Weak bases are weak electrolytes that don’t completely ionize, but instead reach a state of equilibrium. Bases are characterized by THREE major features: they may possess metals, they may have a negative charge or they may be an amine. Concept #8: Bases and Group 1A. Now if we take a look here, we’re going to say when it comes to bases, there are three features that we’re supposed to look out for. Generally, bases posses metals. If a metal is involved, then it’s most likely going to be a base. We’re going to see a couple of exceptions of that when we get to amphoteric species. But for right now, let’s not worry about that. Next, we’re going to say bases tend to have a negative charge. So bases will have metals or a negative charge, or they’re going to get classified as another compound which we call amines. Now amines are an organic type of compound. But we get to see them for the first time in chemistry. So before you guys move to organic, you got a small taste of what amines are, and how exactly do they relate to bases. So if we take a look at the rules, we’re going to say any group 1A metal, when they combine with any four of these ions (OH-, H-, O2- or NH2-) make a strong base. Now these four ions, we call them hydroxide ion. Hydrogen can be positive or negative. When it’s positive, it’s called hydronium ion. But when it’s negative, it’s called hydride ion. O2- is oxide and NH2- is amide. So notice how all of them end with ide because they have a negative charge present. So if one of these negative ion group with any group 1A metal, it’s going to create a strong base. Now recall, what are the charges of group 1A metals? Group 1A metals are +1. So examples, we could have NA+, Li+, Cs+ and K+. Any of these ions could react with any one of those four ions to give me a strong base. So here, Na+ OH- combined together to give me NAOH. This (Li+ H-) would give me LiH. The 2 from here (O2-) would come here (Cs+), the 1 from here (Cs+1) would come here (O2-) Cs2O. Then here (K+ NH2-) we’d have KNH2. Remember you could mix and match any group 1A ion with any one of those four. He we get Sodium hydroxide, Lithium hydride, Cesium oxide, Potassium amide. So again, any group 1A metals with any of those four ions will create a strong base. And strong bases don’t require an ice chart in order to find Ph or POH. Any Group 1A metal when combined with OH –, H –, O2– or NH2 – makes a STRONG BASE. Concept #9: Bases and Group 2A. Next we’re going to say group 2A ions, and here there’s a caveat. It’s not all group 2A. It’s certain metals in group 2A. So we’re going to say, any group 2A metal from Calcium to Barium, when combined with OH-, H-, O2- or NH2- will create a strong base. So remember, if you look at your periodic table, group 2A, we’re going to see Beryllium, Magnesium, Calcium, Strontium, Barium. And we have Arum at the bottom as well and usually we don’t see bases with that so we’re not going to worry too much with that. So what we’re seeing from Calcium and lower, so the cut off is Calcium. These two (Be, Mg) will get left out. So here we’re going to say, group 2A is +2 in charge. So we could have these (Ca2+, Ba2+, Sr2+, Ca2+) reacting with any one of these ions (OH-, H-, O2-, NH2-). So the 2 from here (Ca2+) will come over here (OH-), the 1 from here (Ca2+) will move over here(OH-) and cause nothing, so this would be Ca(OH)2. Here we’re going to get the 2 from here (Ba2+) coming here (H-), BaH2. This (Sr2+) is +2, this (O2-) is -2 so when they combine they cancel out (SrO). And then the 2 from here (Ca2-) can come down here (NH2-), Ca(NH2)2. So those are all examples of strong bases. Now we’re going to say here, that Magnesium is above Calcium. And we’re going to say Magnesium hydroxide is a base. Now technically it’s a weak base, it’s not as strong as the others. The others break up 100%. But here’s a thing about Magnesium hydroxide. We’re going to say that a small portion of it will dissolve, let’s say about 10% of it dissolves. That small portion of it that does dissolve, it dissolves all the way. And when it comes to weak acids and bases, sometimes a piece of it will dissolve, but not completely. For Magnesium hydroxide, a small portion of it dissolves, and it dissolves completely. Because of that weirdness, we’re going to say Mg(OH)2 is not a strong base, but it’s strong enough that we don’t need to do an ice chart. So we’re going to say that Magnesium hydroxide is a weird special case. Technically it’s weak, but it’s strong enough that it may not require an ICE chart. Just make a little note of that. Group 2A metals, from Ca2+ to Ba2+, when combined with OH –, H –, O2– or NH2 – makes a STRONG BASE. Amines are compounds with only nitrogen or hydrogen (i,e. NH3) or with carbon, nitrogen and hydrogen (i,e. CH3NH2). Then finally the last group we talked about, we’re going to say amines. And since we’re going to need some room guys to do this, I’m going to remove myself from the image so we have more room to work with. So amines, what the heck is an amine? Well we’re going to say an amine is a compound that has N and H, Nitrogen and Hydrogen, such as example, NH3. Or it is a compound that has Carbon, Hydrogen and Nitrogen. Example of that, we could have CH3NH2. So just remember that. Amines are compounds with Nitrogen and Hydrogen or Carbon, Hydrogen and Nitrogen. We’re going to say here that neutral amines, ones without charges, are considered to be weak bases. Examples, the two we just wrote, NH3 or CH3NH2. Obviously there are more than just these, but these are two good examples. We have Ammonia and then Methylamine. The name even tells you that it’s an amine. And we’re going to say next that positively charged amines are considered to be weak acids. So here we could have NH4+ which is Ammonium. This (NH3) is Ammonia. So Ammonium is positive so it is a weak acid. Or CH3NH3+, this would be Methyl ammonium. Now, we saw compound earlier when we talked about binary acids. That compound was HCN. Now HCN has the characteristic of an amine right? I said it was Carbon, Hydrogen and Nitrogen. But remember, you can’t be a binary acid and amine at the same time. So HCN, even though it has those three elements is not an amine. It’s not an amine, it is a binary acid, so make note of that. This is Hydrocyanic acid, not an amine. So just make note of that, what an amine is. It usually has just N and H, or it could have H, C and N. HCN though, is not an amine, it’s a binary acid. So look out for those characteristics. And if they give you the name, usually you’ll see an amine in the name in some way. That would be a clear giveaway that you’re dealing with an amine. Now hopefully you guys have learned how to identify acids and bases now, because again, it’s imperative that you know how to identify them as either weak or strong because if you don’t know that, you won’t know how to calculate PH or anything else dealing with acid base chemistry. Neutral Amines are considered weak bases. Positive Amines are considered weak acids. Practice: Classify each of the following as a strong acid, weak acid, strong base or weak base. Practice: Classify each of the following as a strong acid, weak acid, Strong base, or weak base. Which of the following cannot be an acid? a. HCN b) H2SO3 c) C6H5OH d) C5H12 e) All are acids. Which of the following statements is/are correct? a) CH3OH is an Arrhenius Base. b) BF3 is a Bronsted-Lowry Acid. c) NH4+ is a Bronsted-Lowry Base. d) CN – is a Lewis Base. Chlorine forms four oxyacids. Two of these are HClO 2 and HClO4. Of these a. HClO2 is a strong acid and HClO4 is a weak acid. b. HClO4 is a strong acid and HClO2 is a weak acid. c. Both HClO2 and HClO4 are strong acids. d. Both HClO2 and HClO4 are weak acids. Knowing if you have a weak or strong acid or base is important in determining if you use an ICE Chart or not. The reason HI is a stronger acid than HCl is because A) the difference in electronegativity gets larger as the atoms get farther apart on the periodic table. B) electronegativity increases as you go up the periodic table. C) the bond strength decreases down a group in the periodic table. D) anion radius decreases as you go down the periodic table. E) HI is an Arrehnius acid and HCl is not. Of the following, which is the weakest acid? A) HIO B) HIO 2 C) HIO 3 D) HIO 4 E) The acid strength of all of the above is the same. Which of the following is TRUE? A) A neutral solution contains [ H 2O ] = [ H 3O+ ] B) A neutral solution does not contain any H 3O+ or OH- C) An acidic solution has [ H 3O+ ] &gt; [ OH - ] D) A basic solution does not contain H 3O+ E) None of the above are true. Briefly describe the difference between Bronsted acid and bases and Lewis acid and bases. For example, are all Bronsted acids also Lewis acids; are all Lewis acids also Bronsted acids? Whenever we have a WEAK ACID or a WEAK BASE then we must use an ICE CHART. Remember in this case the units in this chart are in _______________. The hypochlorite ion, ClO-, acts as a weak base.Is ClO- a stronger or weaker base than hydroxylamine? Predict which member of each pair produces the more acidic aqueous solution?Fe2 + or Fe3 + . Predict which member of each pair produces the more acidic aqueous solution?Al3 + or Ga3 + . Arrange the following 0.10 M solutions in order of increasing acidity: (i) NH4 NO3, (ii) NaNO3, (iii) CH3 COONH4, (iv) NaF, (v) CH3 COONa. Why is there more than one definition of acid-base behavior? Which definition is the right one? Indicate whether each of the following statements is correct or incorrect.Every Brønsted-Lowry acid is also a Lewis acid. Indicate whether each of the following statements is correct or incorrect.Every Lewis acid is also a Brønsted-Lowry acid. Define each of the following with complete sentences, and provide an example chemical equation: an Arrhenius acid, a Brønsted-Lowry base, and a Lewis acid. In many reactions the addition of AlCl3 produces the same effect as the addition of H+.Which acid-base theory is most suitable for discussing the similarities between AlCl3 and H+? Based on their molecular structure, pick the stronger acid from the following pair of binary acids: HF and HCl. Based on their molecular structure, pick the stronger acid from the following pair of binary acids: H2 O or HF. Based on their molecular structure, pick the stronger acid from the following pair of binary acids: H2 Se or H2S. For a binary acid, H Y, what factors affect the relative ease with which the acid ionizes? Trends in acid strength for the binary hydrides of periods 2-4.Are the acid properties of HI what you would expect from this figure? Indicate whether each of the following statements is true or false.In general, the acidity of binary acids increases from left to right in a given row of the periodic table. Based on their molecular structure, pick the stronger acid from the following pair of oxyacids: H2 SO4 or H2SO3. Based on their molecular structure, pick the stronger acid from the following pair of oxyacids: HClO2 or HClO. Based on their molecular structure, pick the stronger acid from the following pair of oxyacids: HClO or HBrO. Based on their molecular structure, pick the stronger acid from the following pair of oxyacids: CCl3 COOH or CH3COOH. What factors affect the relative acidity of an oxyacid? Which acid has the larger acid-dissociation constant, HIO2 or HBrO3? Consider the molecular models shown here, where X represents a halogen atom.If X is the same atom in both molecules, which one will be more acidic? Consider the molecular models shown here, where X represents a halogen atom.Does the acidity of each molecule increase or decrease as the electronegativity of the atom X increases? You may want to reference (Pages 273 - 278)Section 7.6 while completing this problem.Suppose that a metal oxide of formula M2O3 were soluble in water. What would be the major product or products of dissolving the substance in water? State whether each of the following statements is true or false. Justify your answer in each case.Methanol is a base. How can you determine whether an anion will act as a weak base? What kinds of cations act as weak bases? List some examples. Ammonia, NH3, acts as an Arrhenius base, a Brønsted-Lowry base, and a Lewis base, in aqueous solution.Write out the reaction NH3(aq) undergoes with water. Based on these molecular views, determine whether each pictured base is weak or strong.Picture (a) . Based on these molecular views, determine whether each pictured base is weak or strong.Picture (b) . Based on these molecular views, determine whether each pictured base is weak or strong.Picture (c) . Based on these molecular views, determine whether each pictured base is weak or strong.Picture (d) . The hypochlorite ion, ClO-, acts as a weak base.When ClO- acts as a base, which atom acts as the proton acceptor? Consider the base hydroxylamine, NH2OH.When it acts as a base, which atom in hydroxylamine accepts a proton? What are the general physical and chemical properties of acids? Explain the difference between a strong acid and a weak acid and list one example of each. State whether each of the following statements is true or false. Justify your answer in each case.HCl is a weak acid. Explain the difference between a strong acid and a weak acid. For Mn3 + , write an equation that shows how the cation acts as an acid. Based on these molecular views, determine whether is pictured acid is weak or strong.Picture (a) . Based on these molecular views, determine whether is pictured acid is weak or strong.Picture (b) . Based on these molecular views, determine whether is pictured acid is weak or strong.Picture (c) . Based on these molecular views, determine whether is pictured acid is weak or strong.Picture (d) . For NH4+, write an equation that shows how the cation acts as an acid. For Co3 + , write an equation that shows how the cation acts as an acid. For CH2NH3+, write an equation that shows how the cation acts as an acid. Indicate whether each of the following statements is true or false.In a series of acids that have the same central atom, acid strength increases with the number of hydrogen atoms bonded to the central atom. In many reactions the addition of AlCl3 produces the same effect as the addition of H+.Predict the result of the reaction between AlCl3 and NH3 in a solvent that does not participate as a reactant. Express your answer as a chemical equation. Identify all of the phases in your answer.a. For NH4+, write an equation that shows how the cation acts as an acidb. For Co3+, write an equation that shows how the cation acts as an acidc. For CH2NH3+, write an equation that shows how the cation acts as an acid. Nitric acid is a strong acid, but nitrous acid is a weak acid. Why? Write equations showing how each of the following weak bases ionizes water to form OH-. a.) CO32-. b.) C6H5NH2. c.) C2H5NH2. Express your answer as a chemical equation. Which of the following is not a property of an acid? a) Acids have a slippery feel. b) Acids have a sour taste. c) Acids dissolve many metals. d) Acids turn litmus paper red. e) All of the above are properties of acids. Complete the following sentences about strong and weak acids and bases. Strong acids are generally either hydrohalic acids (ex. _____) or oxoacids in which the number of oxygen atoms exceeds the number of ionizable _____ by 2 or more (ex. HNO3). Weak acids are usually one of the following: 1. hydrofluoric acid, _____, 2. acids in which the proton is not bonded to an oxygen atom or a halogen (ex. _____), 3. _____ where the number of oxygen atoms equals or only exceeds by 1 the number of ionizable _____ (ex. _____) or 4. _____ (ex. _____). Strong bases are _____ of group _____ metals (ex. _____) or larger group _____ metals (ex. _____), or oxides of the same metals. Weak bases are usually compounds containing a nitrogen atom with _____ bond(s) and 1 lone pair(s) (ex. _____). What is an acid and what is a base? An acid–base reaction is sometimes called a proton-transfer reaction. Explain. A substance that contains hydrogen that may be replaced by a metal is a/an a. nonmetal. b. colloid. c. acid. d. base. In aqueous solution, classify these compounds as strong acids, weak acids, strong bases, weak bases, or other. For ClO2-, write an equation that shows how the anion acts as a base. Rank the compound in the following groups in order of increasing acidity or basicity, as indicated, and explain the order you assign. (c) basicity: Mg(OH)2, Si(OH)4, ClO3(OH) (Hint: Formula could also be written as HClO4). The following scene represent three weak acid HA (where A = X, Y, or Z) dissolved in water (H2O is not shown):(e) If equimolar amounts of the sodium salts of the acids (NaX, NaY, and NaZ) were dissolved in water, which solution would have the highest pOH? The lowest pH? The following three diagrams represent three different solutions of the binary acid HA. Water molecules have been omitted for clarity and hydronium ions (H3O+) are represented by hydrogen ions (H+). Rank the acids in order of decreasing acid strength. Place the specie in the following group in order of increasing acid strength.c. NH4+, HONH3+Give reasons for the orders you chose. Rank the solutions from most acidic to most basic: 1.0 x 10-3 M HCl, 1.0 x 10-7 M HCl, 1.0 x 10-3 M NaOH, 1.0 x 10-7 M NaOH. The following diagrams represent aqueous solutions of two monoprotic acids, HA (A = X or Y). The water molecules have been omitted for clarity.Which is the stronger acid, HX or HY? In the reaction HF + H2O → F- + H3O+ which is the acid and which is the base? Classify the following as a strong acid, weak acid, strong base, or weak base in aqueous solution. The following illustration displays the relative number of specie when an acid, HA, is added to water.a. Is HA a weak or strong acid? How can you tell? A codeine-containing cough syrup lists codeine sulfate as a major ingredient instead of codeine. The Merck Index gives C36H44N2O10S as the formula for codeine sulfate. Describe the composition of codeine sulfate. (See Exercise 155.) Why is codeine sulfate used instead of codeine?Exercise 155. Codeine (C18H21NO3) is a derivative of morphine that is used as an analgesic, narcotic, or antitussive. It was once commonly used in cough syrups but is now available only by prescription because of its addictive properties. If the pH of a 1.7 x 10-3-M solution of codeine is 9.59, calculate Kb. Phenylephrine, an organic substance with molecular formula C9H13NO2, is used as a nasal decongenstant in over-the-counter medications. The molecular structure of phenylephrine is shown below using the usual shortcut organic nomenclature.Would you expect a solution of phenylephrine to be acidic, neutral, or basic? Phenylephrine, an organic substance with molecular formula C9H13NO2, is used as a nasal decongenstant in over-the-counter medications. The molecular structure of phenylephrine is shown below using the usual shortcut organic nomenclature.One of the active ingredients in Alka-Seltzer PLUS cold medication is "phenylephrine hydrochloride." How does this ingredient differ from the structure shown below? Phenylephrine, an organic substance with molecular formula C9H13NO2, is used as a nasal decongenstant in over-the-counter medications. The molecular structure of phenylephrine is shown below using the usual shortcut organic nomenclature.Would you expect a solution of phenylephrine hydrochloride to be acidic, neutral, or basic? When carbon dioxide dissolves in water, it undergoes a multistep equilibrium process, with Koverall = 4.5 x 10−7, which is simplified to the following: CO2(g) + H2O(l) ⇌ H2CO3(aq) H2CO3(aq) + H2O(l) ⇌ HCO3−(aq) + H3O+(aq)(a) Classify each step as a Lewis or a Brønsted-Lowry reaction. Calcium propionate [Ca(CH3CH2COO)2; calcium propanoate] is a mold inhibitor used in food, tobacco, and pharmaceuticals. (a) Use balanced equations to show whether aqueous calcium propionate is acidic, basic, or neutral. Consider 0.10 M solutions of the following compounds: AlCl 3, NaCN, KOH, CsClO4, and NaF. Place these solutions in order of increasing pH. Classify these compounds as acid, base, salt, or other. Drag the appropriate items to their respective bins. Liquid ammonia autoionizes like water:2NH3(l) ⟶ NH4+(am) + NH2−(am)where (am) represents solvation by NH3. (b) What are the strongest acid and base that can exist in NH 3(l)? Place the specie in the following group in order of increasing acid strength.a. H2O, H2S, H2Se (bond energies: H—O, 467 kJ/mol; H—S, 363 kJ/mol; H—Se, 276 kJ/mol)Give reasons for the orders you chose. Place the specie in the following group in order of increasing acid strength.d. NH4+, PH4 + (bond energies: N—H, 391 kJ/mol; P—H, 322 kJ/mol)Give reasons for the orders you chose. HX (ℳ = 150. g/mol) and HY (ℳ = 50.0 g/mol) are weak acids. A solution of 12.0 g/L of HX has the same pH as one containing 6.00 g/L of HY. Which is the stronger acid? Why? Indicate whether each of the following statements is true or false.Hydrotelluric acid (H2Te) is a stronger acid than H2 S because Te is more electronegative than S.
Explain why the ionization constant, K a, for HI is larger than the ionization constant for HF. Which acid has the largest Ka: HClO2(aq), HBrO2(aq) or HIO2(aq)? Place the specie in the following group in order of increasing acid strength.b. CH3CO2H, FCH2CO2H, F2CHCO2H, F3CCO2HGive reasons for the orders you chose. You may want to reference (Pages 274 - 278) Section 7.6 while completing this problem.Arrange the following oxides in order of increasing acidity: CO2, CaO, Al2O3, SO3, SiO2, P2O5. Explain why the ionization constant, K a, for H2SO4 is larger than the ionization constant for H2SO3. Write a generic equation showing how a weak base ionizes water. Basicity in the gas phase can be defined as the proton affinity of the base, for example, CH3NH2(g) + H+(g) ⇌ CH3NH3+(g). In the gas phase, (CH3)3N is more basic than CH3NH2, while in solution the reverse is true.Account for this observation. The fluoride ion reacts with water to produce HF. Write out the chemical equation for this reaction. You may want to reference (Pages 131 - 137) Section 4.3 while completing this problem.State whether each of the following statements is true or false. Justify your answer in each case. (a) NH3 contains no OH- ions, and yet its aqueous solutions are basic. When hydroxylamine acts as a base, which atom accepts the proton? Write an equation for the reaction in which H2C6H7O5–(aq) acts as a base in H2O(l). For ClO–, write an equation that shows how the anion acts as a base. For CN–, write an equation that shows how the anion acts as a base. Which of the following anions act as weak bases in solution? For F–, write an equation that shows how the anion acts as a base. For C7H5O2–, write an equation that shows how the anion acts as a base. Classify each of the following anions as basic or neutral. How can you determine if an anion will act as a weak base? Write a generic equation showing the reaction by which an anion, A–, acts as a weak base. Classify each of the following as a strong acid or a weak acid. The disinfectant phenol, C6H5OH, has a pKa of 10.0 in water, but 14.4 in methanol. (c) Write the dissociation reaction of phenol in methanol. The scene below represents a sample of a weak acid HB (blue and purple) dissolved in water. Draw a scene that represents the same volume after the solution has been diluted with water. For C5H5NH+, write an equation that shows how the cation acts as an acid. How would you differentiate between a strong and a weak monoprotic acid from the result of the following procedure? (b) Equal molarities of each are tested with pH paper. Determine whether each cation is acidic or pH-neutral. How would you differentiate between a strong and a weak monoprotic acid from the result of the following procedure? (c) Zinc metal is added to solutions of equal concentration. The following diagrams represent aqueous solutions of three acids, HX, HY, and HZ. The water molecules have been omitted for clarity, and the hydrated proton is represented as a simple sphere rather than as a hydronium ion.Which of the acids is a strong acid? Write an equation for the reaction in which H2C6H7O5–(aq) acts as an acid in H2O(l). Determine whether each of the following cations is acidic or pH-neutral. Assuming equal concentrations, rank these solutions by pH. Assuming equal concentrations, rank these solutions by pH. Highest pH(1) Lowest pH(5)RbOH(aq), Sr(OH)2(aq), HCl(aq), HF(aq), NH3(aq), from highest to lowest. Consider three generic acids: HX, HY, and HZ. Rank these acids according to strength. In aqueous solution, classify these compounds as strong adds, weak acids, strong bases, or weak bases. Identifty the following acids as monoprotic, diprotic, or triprotic. Place each acid in the appropriate bin. Classify these compounds as strong acids or weak acids. Write equations showing how each of the following weak bases ionizes water to form OH-.a) HCO3-b) CH3NH2Identify all of the phases in the answer. Assuming equal concentrations, rank these solutions by pH from highest pH to lowest pHSr(OH)2(aq), NaOH(aq), NH3(aq), HBrO(aq), HBr(aq)Please explain with explanation.